It is sometimes useful to enable the guest account for guest access under Windows 8.1 or 8! You can activate at any time, the Windows 8.1 guest account or if require, deactivate again. The Windows 8.1 guest account is disabled by default. (... see Image-2)! But you can enable also the guest account on Windows 8.1 via standard user management! Look here: ... change the administrator in Windows 8.1 or 8! If you ever look at the pictures it is almost self explanatory! (Image-1) Enable in Windows 8.1 the guest account for guest access! 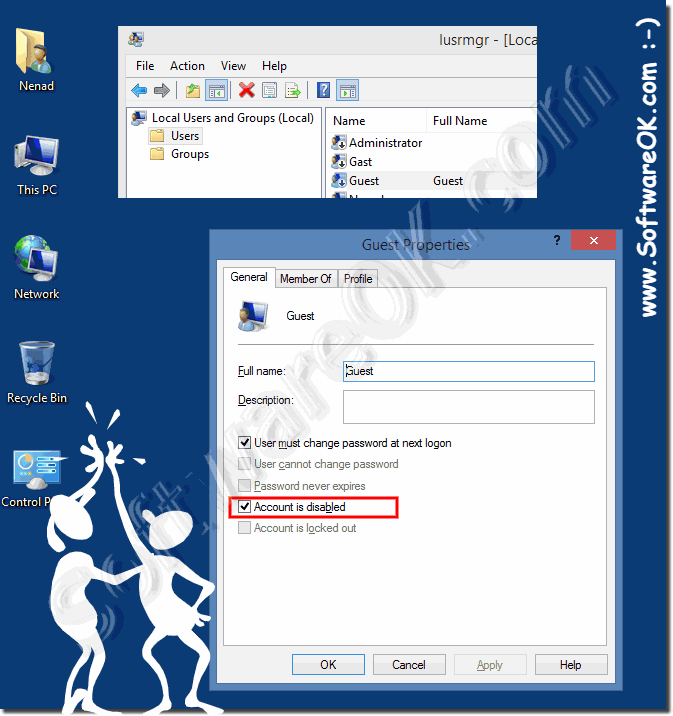 (Image-1) enable or disable the guest account in Windows! Windows-8 - FAQ-205: How to enable the guest account for guest access under Windows 8.1? How to let guest account access some softwares Windows-8.1 allow guest access? How to disable guest account in Windows 8.1? Activate guest account windows 8.1? Windows 8.1 login to guest account? How to access guest account in windows 8.1? Turn on guest account in win 8.1 and 10? Win 8 let guest account access software? Allow guest access from betwork windows 8? Windows 8.1 and 10 guest account? Win8.1 guest account activate network? Eneble to guest mode in geoneef103? Internet guest account on windows server 2008? Windows 8 enable network access for guest account? Microsoft windows 8 guest account no explorer? Getting a server to allow guest access windows 8.1 and 10? Windows server 2012 enable guest account? Enable guest user on server 2012? How to add office for guest user windows 8? Enabling guest account on win 8.1?